Inappropriate Date Proposals, Part 2, and Red Wine Risotto – domestic diva, M.D. In addition to tattoo artists in the midst of etching permanent ink, there are other times when it might not be the best to ask out a girl. I was on my family medicine rotation during my third year of medical school. Now, as a medical student, you’re normally sent in first to take a “history and physical”- which is a fancy way of saying you get the patient’s story and then performed a focused exam (you just look at what’s wrong, plus listen to the heart and lungs for good measure). Yes, it might take longer to see a med student first, but I’d highly recommend it because a) it’s probably the best medical history anyone will ever take of you and b) if you’re being seen at a teaching institution, you’ll get seen faster by both a medical professional period and then the physician. Anyway, I was sent in to see a patient having “nose pain.” That translated into a 20-something year old male whose nose was swollen on one side. His story was pretty limited (started a few days ago, never happened before, hurts to touch), so I then moved on to the exam. I was in the midst of looking inside his nose when the following conversation occurred. Me: So it looks like you have an infected ingrown hair inside your nose. Him: Cool. That’s why it hurts. Hey, you’re really hot. Want to go on a date? Him: You can totally break that rule. Besides, my mom works for Michigan. That makes it okay. I then felt that was the best time to go grab the attending physician to present the patient (in order words, recapping my findings) so we could get him out of there as soon as possible. He asked me upon leaving IN FRONT OF THE PHYSICIAN if I would reconsider. can risotto get any better! it can- just add wine! Bring chicken broth to a boil, then reduce to simmer. Add dry rice and saute for 2 minutes, stirring constantly. Add 1/2 c red wine and stir until absorbed. Add the rest of the wine and repeat. Once the rice has absorbed the wine, start adding the chicken broth, one ladle at a time. Your goal is to have this at a simmer. Stir frequently until absorbed. Add more chicken broth. This does take a while (you’re looking at about 30 minutes of active cooking from start to finish). When you’ve added about 3 c of the chicken broth, taste the rice. You’re looking for a pasta-like al dente (just chewy) consistency. It might not be done yet. Continue adding chicken broth until rice reaches this consistency and is creamy. Finish with parmesan cheese and salt and pepper to taste. It’s really not as hard as everyone makes it out to be- it just takes a while. I normally pair it with my salmon recipe since that requires no energy at all. Risotto … in all forms works for me – love doing it too .. a bit of stirring. Meet one on for the star chef’s in Scotland – he did the best risotto so fare and he did it in the oven … never dared to ask how and I’m not to sure he would hav told me neither. He worked with a big beautiful AGA and put everything in the oven under tight cover – came out beautiful and creamy. Tony is still there – have a look at this place …. http://www.knockinaamlodge.com/ stunnig everything and so the food. I’ve heard rumors you can do it that way…I might track down a recipe and figure it out. I don’t mind it taking a while though- there’s something stress relieving about stirring rice for me! I know … he just put everything in the pan … and foil on top – but when I left the kitchen, so I don’t really know the end of the story. 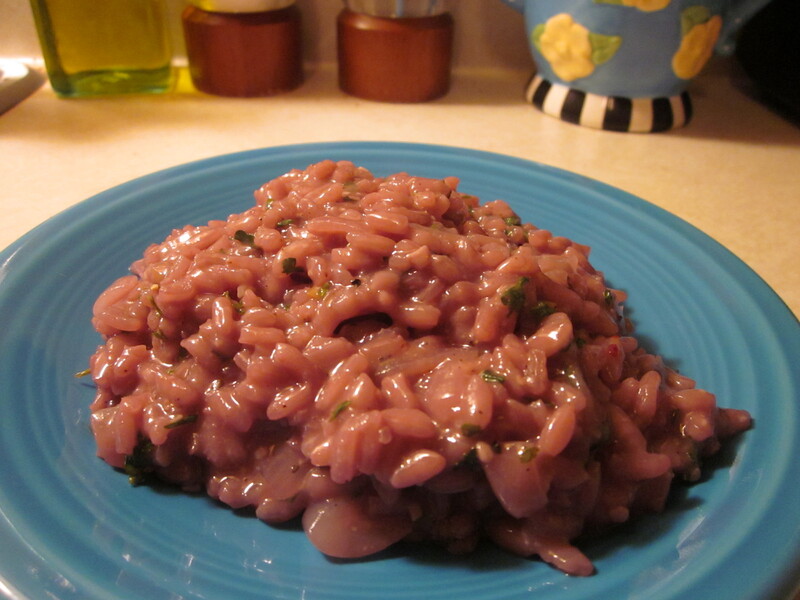 Red wine risotto is one of my favorites! I make mine almost exactly the same way, except I add some cooked green peas in at the end. Delicious! Never tried it with red wine…. It does make it look rather…..unusual!! I make a yummy wild mushroom risotto with white wine. The addition of red wine sounds great and it would definitely pair well with salmon or steak. Mmmmm. And that was another totally inappropriate date proposal…ingrown nose hair…ew…. Excellent risotto. Does this sort of thing happen to you often? Are we going to get to enjoy reading an “inappropriate date proposal” series. Maybe an offshoot blog? I agree with you! I bet you couldn’t get out of there fast enough! Love risotto, don’t like the color of that recipe though. I prefer a variety of colors, which is why I primarily use chicken stock and white wine (if there is any leftover) and colored things like yellow peppers and herbs and tomatoes. Hope you weren’t the one who had to treat the ingrown hair. Hey, you gotta appreciate a guy that is a go get “her”! Lol! Delicious risotto. I could eat a whole plate about now, yum! Wine really does make everything better! And this looks fabulous! 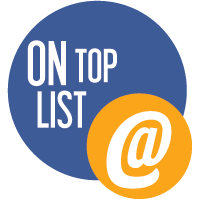 Ok, while you’re inspecting a guy’s ingrown nose hair just doesn’t seem like the most brilliant time to request a date – but totally hilarious blog fodder. I have never made risotto, but it looks delicious. Will be trying this on my husband. My cousin once told me he thought his doctor was into him so he scheduled an appointment to see her again but then ask her out. Thinking it was some kind of romantic idea. He could tell by the look on my face that I knew he was in dream land and of course had excuses “No, if you were there, you would have thought she was into me, too. She even said something nice about me to the nurses”. But I just said “That’s a waste of her time, your money and a stupid idea. If you really think there’s a chance in hell, just call the office and take no for an answer”. Great!! You made my day! !….will try risotto..can already smell the delicious aroma!! I’ve been craving risotto made with red wine- great post! Ewww, although that risotto sounds nice, I couldn’t imagine eating little soft globules after the story of looking up someones nose. There’s a good reason that I don’t work in healthcare! So was it the clinical setting or that he had a yucky owie? If it had been a manly injury, something to do with falconry or some such, would you have thought differently? 1) I am not technically allowed to be asked out by patients while I am treating them. 2) I’d forever associate him with that infected ingrown hair. 3) It didn’t help that he kept leering suggestively in additional to all of this. Risotto is a labor of love and completely worth the effort. Never tried it with red wine but will correct that soon. Yes for the story, no for the red wine in the risotto. Looking up an infected nose is never going to end romantically, but the guy was a trier. I can’t get enough of risotto and this is a good one. I use white wine all the time. Next time I’ll use red…not only for the taste but the lovely color. You make me laugh so much!! I wouldn’t mind some of that guy’s crazy confidence…for starters, you just looked up his infected nose and he thinks you would be willing to go on a date. And then he asks again?? Whatta guy. Now the risotto…he does not even need to speak to get a yes!! This was definitely up their with the tattoo artist. Pretty funny. I’m glad you stopped by my site, I may not have ever found you … and you’re pretty funny 😉 Life experiences are a good source, aren’t they? Thank you for the laugh! And I never thought to add red wine to risotto. Sounds delicious! Looks great, will try this one. Funny story. Hmm my most random innappropriate date proposal? Me: I have a funeral to attend that day. Him:Yea, well what are you doing afterwards?